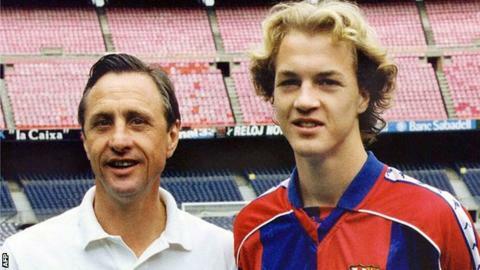 Jordi Cruyff has expressed thanks for the tributes to his father, Dutch footballing great Johan Cruyff. The former Barcelona and Ajax forward died of cancer, aged 68, on Thursday. His family say they will hold a private funeral for the three-time European Footballer of the Year, while a public memorial will also be organised. "It has touched us deeply that Johan was such an inspiration to many of you," said ex-Manchester United midfielder Jordi in a statement. "On behalf of my mother, sisters and the rest of the family I would like to say thank you for all the love, kind words and memories that have been shared with us, since yesterday but also over the past months," added the 42-year-old, who played under his father at Barcelona. Cruyff, who led Barca to their first European Cup in 1992 and also managed Ajax, is widely considered to be one of the world's greatest ever players. Figures from the world of football, Dutch politicians and royalty were among those to pay tribute on Thursday. Read more on Johan Cruyff: Why does Netherlands great matter?